Here are a variety of drop point blades, some in classic designs and some right out of my imagination. Like the Bowie knife, drop points are a timeless style and a lot of fun to make. This Drop-point Hunter is similar to some of the spear-point styles I've done but, a bit broader and done in a full-tang design. This full-tang Hunter is fully forged from 1/4" 52100 ball bearings and 1095 high carbon powdered steel done in a canister weld. The blade is 6" with an overall length of approx. 11". The contoured U-guard is forged from the same ball-bearing damasacus billet as the blade. The handle scales are crackle Mammoth Ivory secured with textured (to match the ivory) stainless steel handle bolts and have beveled edges. 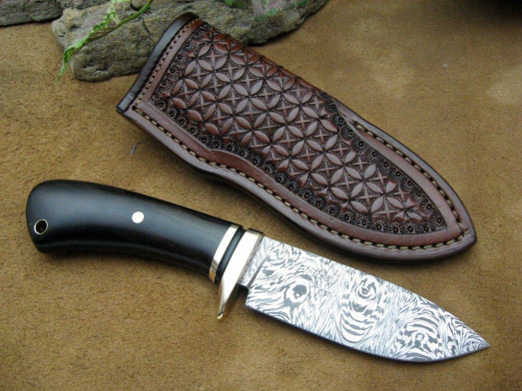 This knife also comes with a fully tooled leather blade sheath with a belt loop. Here is a re-creation of my "Forest Ghost" model in Cru-forge V and a bit ... darker. This full-tang Drop-point Hunter is forged from edge-quenched Cru-forge V high carbon steel with a 4 1/2" cutting edge, top clip and a file worked thumb rest. The entire knife, tang and all, has my "antiqued" finish. The handle scales are stabilized and green dyed, Exhibition-grade Maple Burl wood that has been done in a "palm swell" style. The scales are secured with stainless steel handle bolts with a matching lanyard liner. The overall length on this knife is 9 1/2" and it comes with a fully tooled leather pouch sheath with a belt loop. Here is a new drop-point Bush Knife design with a secondary chisel edge on the spine (please send me an e-mail for more photos to see this option). This hidden-tang knife has a 10 5/8" blade (approx 3/16" thick) forged from my "Frontier" multi-pattern high carbon damascus steel with forge marked/acid soaked flats and a 4" chisel ground scraping/chopping edge on the spine (opposite side). This knife has a contoured guard and a set pin of silica bronze with a matching lanyard liner. The handle is stabilized A-grade Cherry burl wood done in a "palm swell" style. This piece has an overall length of 15 7/8" and comes with a fully tooled leather blade sheath with a belt loop and retention strap. This is a simple design with a wild handle. 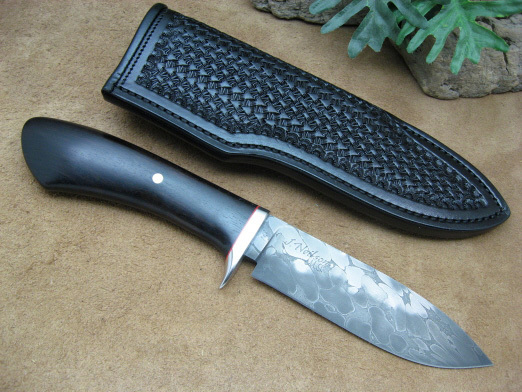 This Drop-point Hunter has a 6" blade forged from 5160 high carbon spring steel with a hand-rubbed finish. The knife has a contoured guard of stainless steel with a "stippled" face. The handle is top grade Maple Burl wood that has been multiple dyed/stabilized and finished off with a stainless steel pin and lanyard liner. The overall length of this knife is 11 1/8" and it comes with a leather blade sheath with a belt loop and retention strap. Here is a new version of an old favorite, my "Jerzee Devil" Drop-point EDC knife. The full-tang blade is forged from 400 layer high carbon damascus done in my "raindrop" pattern with a 4" cutting edge. The handle scales are stabilized and dyed A-grade Curly Maple wood secured with brass handle bolts. 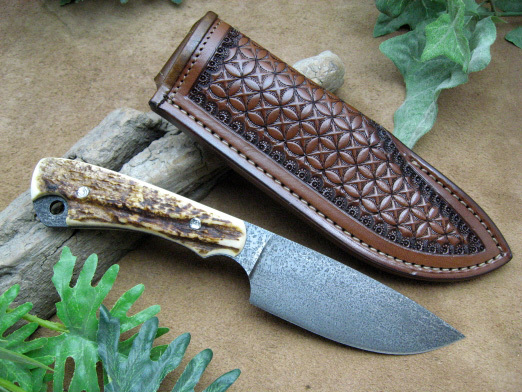 This knife is 8 1/2" overall length and comes with a leather pouch sheath. Fancy Drop Point "Belt-Pocket Knife II"
This small drop point is very similar to my Fancy "Pocket" Drop-point but, with just a bit more girth to the handle for use as a belt knife, though it still has "pocket potential". The blade is 3 1/2" long with a wide belly and is forged from high carbon "W-pattern" damascus steel. The fullered black Micarta spacer is sandwiched between silica bronze with a handle pin to match. The handle is stabilized African Blackwood and has a lanyard hole/liner. 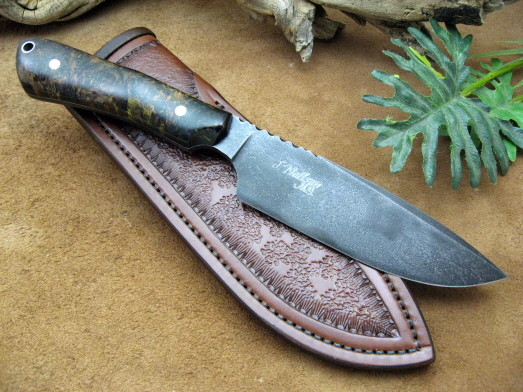 This knife is 7 3/4" total length and comes with a tooled leather pouch sheath with a belt loop. This Drop-point Field knife is forged from 1084 high carbon steel. The blade has a cutting edge of 4 1/4" with an overall length of 8 3/4". The blade has a top clip and is lightly etched to bring out the hamon line. 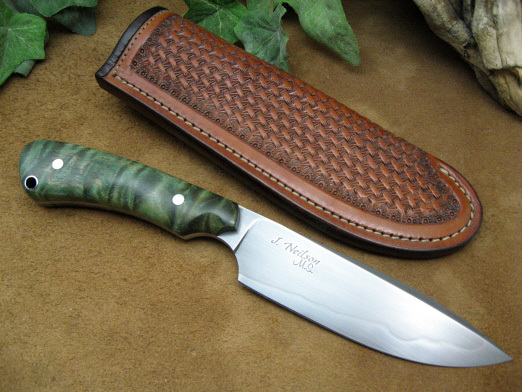 The knife has a tapered tang and handle scales of stabilized/green dyed Curly-quilted Maple, done in a "palm swell" style, and secured with stainless steel handle bolts and a matching lanyard liner. 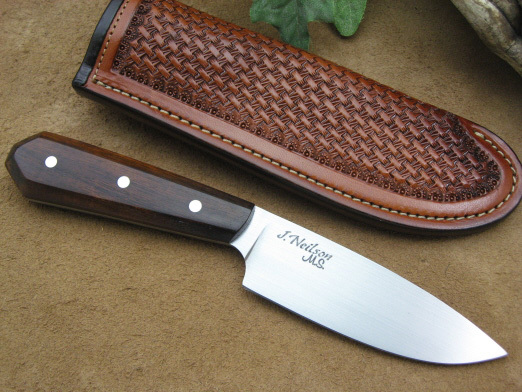 This knife comes with a tooled leather pouch sheath. This Drop-point knife is a variation of my popular B.U.K (basic utility knife) with some bonus good looks. This pattern is slightly larger with a wider blade profile than the original B.U.K. This knife is 6 5/8" overall length with a 3" cutting edge. The knife is forged from high carbon steels done in a "Feather" pattern with a file worked thumb rest. 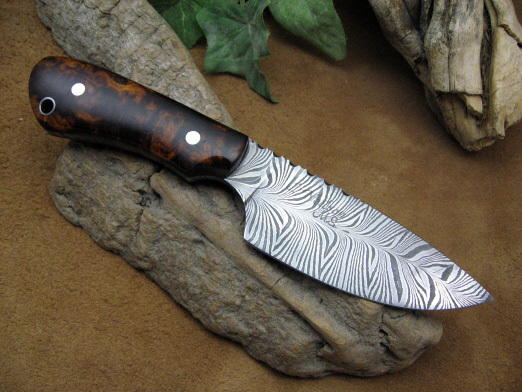 The handle scales are A-grade Desert Ironwood Burl with a stainless steel handle bolts and lanyard liner. 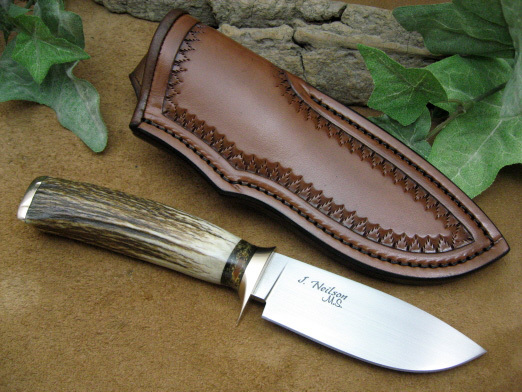 This knife also comes with a finely tooled leather pouch sheath with/without belt loop, your choice. I did a lot of work on this one doing demos at the Alberta Hammer-in, hence the "Alberta" Hunter. This piece has a 3 3/4" blade forged from W1 high carbon steel with a hand-rubbed finish and visible hamon line and is quite suitable for skinning chores as well. The contoured guard and fully threaded pommel are Silica Bronze and the pommel is filed to match the handle grooves. Then handle is Elk antler with a throat of stabilized California Buckeye Burl wood. 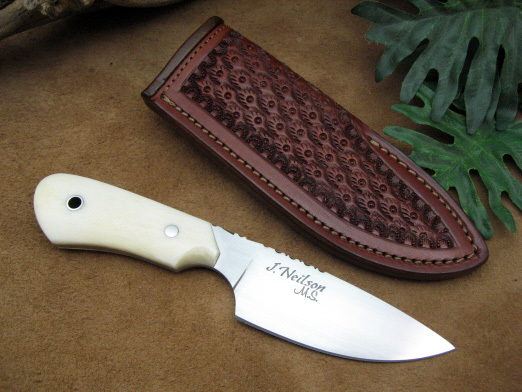 The overall length of this knife is 8 1/4" and comes with tooled leather pouch sheath. This full-tang Drop-point Hunter was forged from edge-quenched 52100 high carbon steel and treated with my antiqued/ boiled mustard finish. The handle scales are Moose antler and secured with "worked" stainless steel handle bolts. The handle has an exposed lanyard hole and the "antiqued" finish shows there as well as the entire spine. 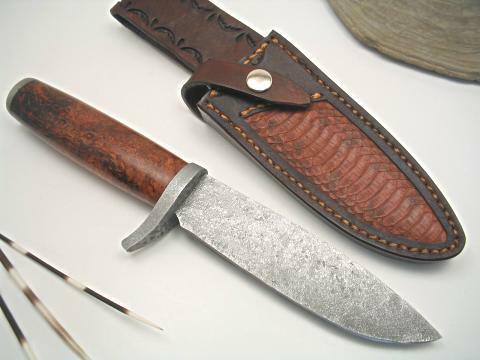 The knife is 8 " overall length with a 3 5/8" cutting edge and comes with a tooled leather pouch sheath with belt loop. 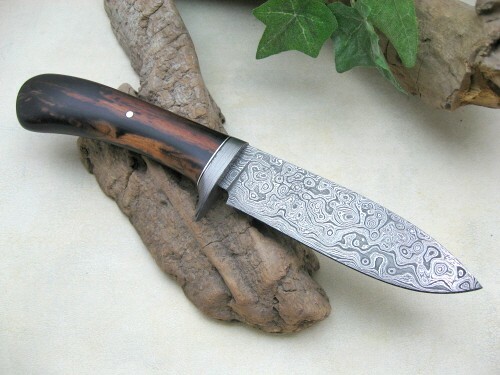 This Drop-point Hunter was forged from 1/4" diameter 52100 high carbon ball-bearings with 1084 powder done in "canister" damascus style with a 4 3/4" blade. The blade is edge-quenched with a visible hamon line. The guard is contoured stainless steel. The handle is stabilized African Blackwood with a red spacer and a stainless steel set pin. 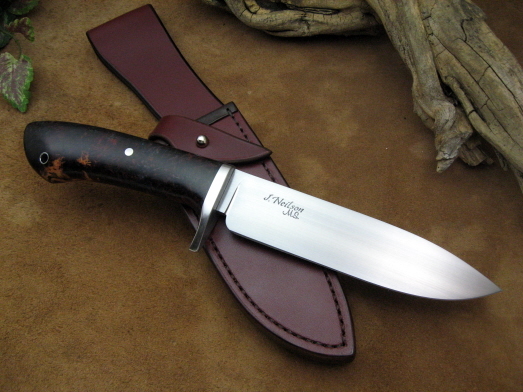 The knife has an overall length of 10" and comes with a tooled leather sheath with belt loop by Paul Long. This Drop-point knife is a variation of my popular B.U.K (basic utility knife). This knife is slightly larger with a wider blade profile. The knife is 6 5/8" overall length with a 3" cutting edge. The knife is forged from 52100 high carbon steel with a hand-rubbed finish and file worked thumb rest. The handle scales are White Bone with a stainless steel pin and lanyard liner. The knife comes with a tooled leather pouch sheath. This full-tang hunter has a 4 5/16" blade forged from 52100 high carbon steel, edge-quenched with a hand-rubbed finish. The handle scales are top grade Desert Ironwood anchored with three stainless steel handle bolts. The overall length on this knife is 8 3/8" and comes come with a new sheath collaboration by Paul Long and myself consisting of a Kydex liner and top grain leather overlay and belt loop. Fancy Drop Point "Pocket Knife"
This slender handled drop point has all the cutting potential of a hunter but, sits comfortably in your pocket for EDC carry. 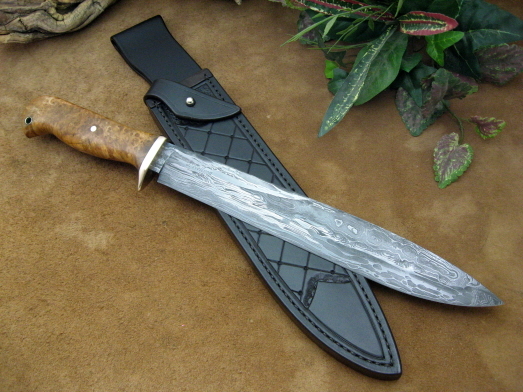 The 3 1/2" wide bellied blade is forged from high carbon W-damascus steel. The fullered black spacer is sandwiched between silica bronze with a handle pin to match. The handle is stabilized African Blackwood. This knife is 7 3/4" total length and comes with a tooled leather pouch sheath with no attachment to sit in the pocket. 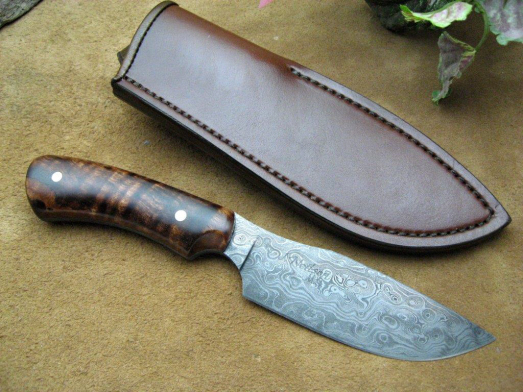 This drop-point hunter has a 4 1/2" blade of 495 layer "raindrop" pattern damascus steel with a matching contoured guard. The handle is stabilized Flame Ebony wood with spacers of black synthetic and .999 fine silver. The knife is finished off with a stainless steel pin, an overall length of 9" and comes with a tooled leather pouch sheath with matching belt loop. This knife has a 5" blade of 1095 high carbon steel with a fully forged, distal tapered blade. The knife is 9 1/2" total length. The blade is soaked/scrubbed in white vinegar repeatedly for an antiqued finish. The guard and pommel are forge piened wrought iron and deeply etched. The tang goes straight through the pommel and is piened over and etched. The handle is stabilized Cherry Burl wood with black spacers. I set my initials in the pommel end of the handle since there is no place to do the chemical etch on the blade. 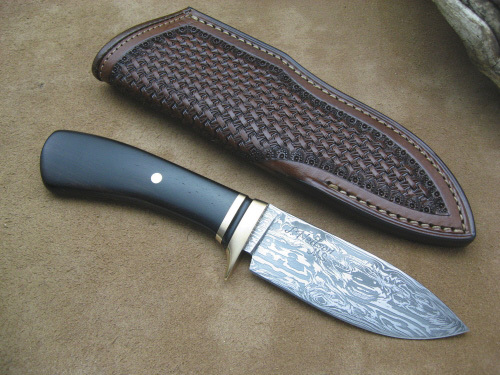 The knife comes with a tooled leather belt sheath with a snake skin inlay.